Disclosure: We received tickets to the show in exchange for sharing about our experience at the show. 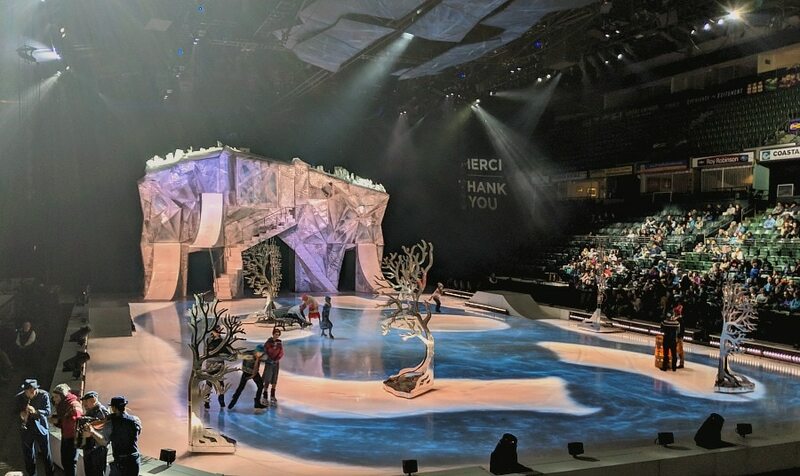 Cirque du Soleil is back in the Puget Sound area this weekend only for a very short run of their popular show, Crystal, which is performed on the ice. You can also still get discount tickets to Cirque du Soleil’s “Crystal” show through Friday April 12th. We had the opportunity to check out the Crystal show on opening night as a family, the first time my girls had been to a show, and we were blown away! 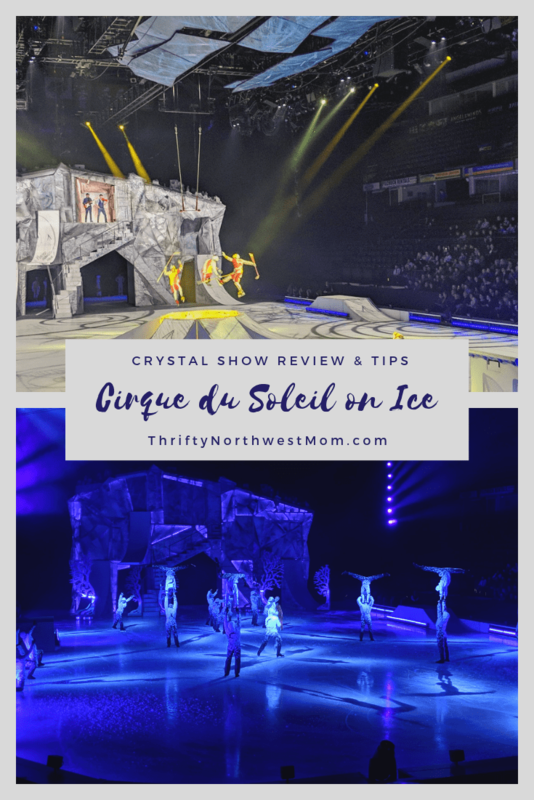 If you have ever been to a Cirque du Soleil show, you know how amazing they are with all the incredible acrobatics, but then to see this all done on ice, was just so much more awe-inspiring to watch! This show combined the different elements of acrobatics from gymnasts and very skilled ice skaters, who all were performing acrobatics on the ice & in the air, it was hard to tell who were the gymnasts & who were the ice skaters. It brought together the circus arts & what you would expect to see from a Cirque du Soleil show combined with what felt like watching Olympic figure skating at the same time. The show included everything from synchronized skating, freestyle figures & extreme skating, jumps & flips alongside swinging trapeze artists, aerial straps to fly through the air & extreme balancing acts while performing acrobatics. It just amazed all of us at the talent these performers had to be able to take the acrobatics & ice skating to a whole new level in this first of its kind circus ice show. There is action happening all around the ice stage during the whole show, so even though the arena is larger than their typical tent venues, there did not seem to be a bad seat anywhere as any direction you could see all that was going on at any time. It was so action-packed with great cinematic & lighting effects, that your attention was constantly trying to take it all in, in a great way! This show is a fun show for a date night or a night out with friends! It also is a show that kids will love, too! We went to an evening show & I didn’t see many kids under 5 (most likely because it was a later show), but I did see kids elementary, middle & high school age & they all looked like they were having a blast. My girls are 10 & 12 & they just watched the show in amazement the whole time – it’s just incredible the skills these performers have. The only thing they did mention is that there was one particular scene with Crystal (the main character in the show) in a romantic setting in the park with a male acrobat as they waltzed on skates & through the air , which my girls said was too much PDA, ha! Nothing inappropriate, just a more romantic scene that adults would appreciate more than kids. Cirque du Soleil is here for just one long weekend in the Puget Sound area for their “Crystal” show. But there are still tickets available for these shows, so make sure to book your tickets right away if you’re interested. Goldstar.com is offering discount tickets for the Cirque du Soleil Crystal show through Friday April 12th . – thsi is the . They are offering discount tickets as low as $45 (Reg $55) – $74 (reg $91). The discount tickets are offered through Sunday April 14, 2019. 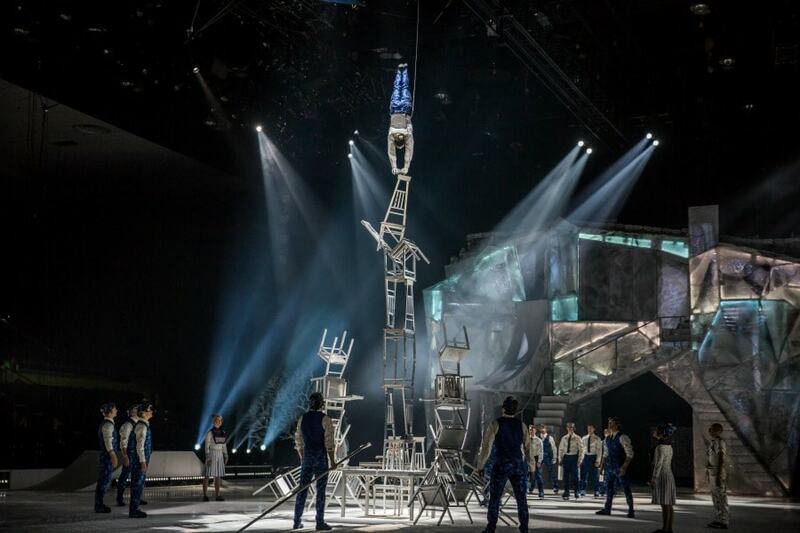 CRYSTAL is Cirque du Soleil’s 42nd creation and explores the artistic possibilities of ice for the first time. 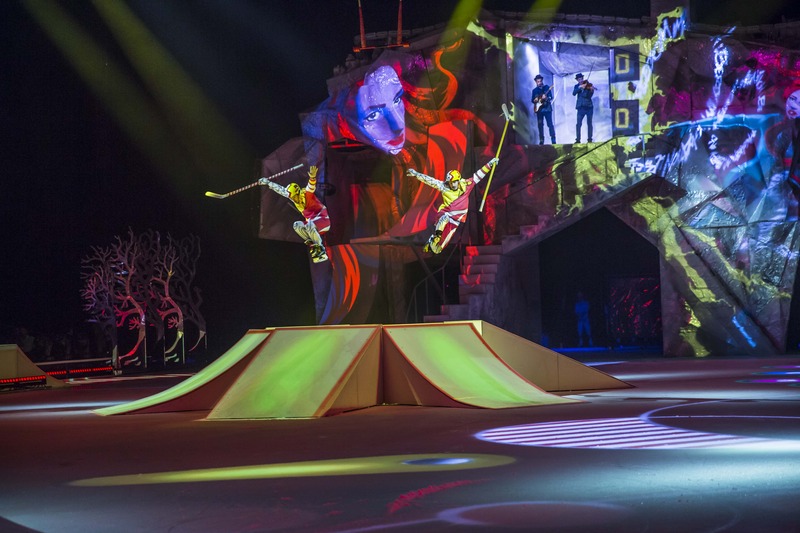 This unique production pushes boundaries of performance by combining stunning skating and acrobatic feats that defy the imagination. Watch as world-class ice skaters and acrobats take their new frozen playground with speed and fluidity as they challenge the laws of gravity with never-before-seen acrobatics. Follow Crystal, the lead character, on an exhilarating tale of self- discovery as she dives into a world of her own imagination. CRYSTAL invites you to suspend reality and glide into a world that springs to a colorful life with astounding visual projections and an original score that seamlessly blends popular music with the signature sound of Cirque du Soleil. CRYSTAL features an international cast composed of figure, extreme and freestyle ice skaters, acrobats, musicians and a comic character. Eleven different nationalities are represented in the cast. Time – The show is about 2 hours long with a 20 minute intermission. If you are going with kids, you might want to check out the daytime shows if your kids are not night owls. Parking – There are a number of free parking spaces within walking distance according to the arena’s website. I did see street parking all around, but did not get there early enough to take advantage of it myself thanks to a rainy evening which meant tons of I-5 traffic. For garage options, there were plenty of spaces in the Snohomish County garage (corner of Wall & Oakes, just across the street from the arena & down a block to the entrance). It cost $10 for the evening to park. Come Early – There are several advantages to coming early. You can take advantage of those free street parking spaces. And you won’t have to worry about the traffic – I sat on one block for 10-15 minutes waiting to get into the parking garage after 7, but my husband had arrived earlier & did not have to wait. So just plan accordingly for traffic if you are coming closer to the showtime. There will be bag checks & security to go thru when you enter, too, which will take a bit more time. Plus, Cirque du Soleil always puts on pre-show entertainment & this show was no exception. They had ice skaters, musicians playing a variety of songs down by the ice as well as a comedian who had my family quite entertained (& the crowd got to participate with throwing snowballs too). Food – There are different options of food & drinks to purchase at the Angel of the Winds arena, everything from lunch/dinner options (pizza, hot dogs,etc), as well as popcorn and mini donuts. We missed these, but I heard they were amazing & you could purchase them by the bucketful. 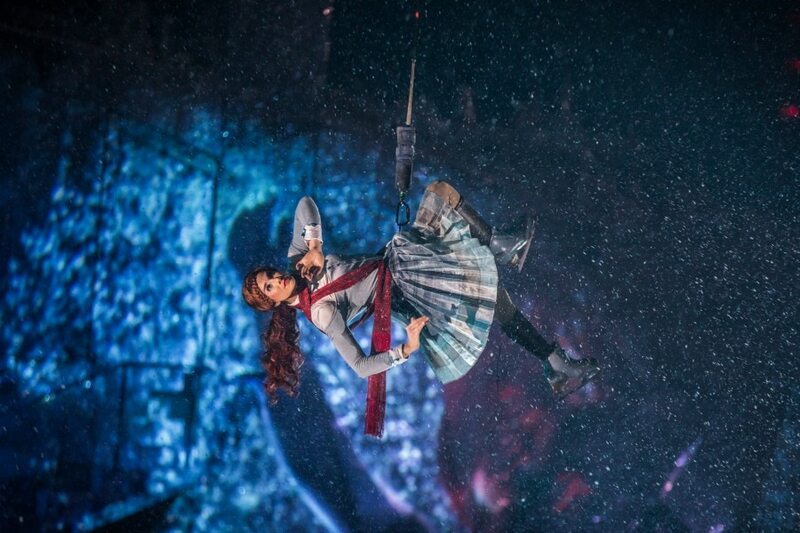 Let us know what you thought of the Cirque du Soleil Crystal show! !